These transfers were taken from a high quality open-reel tape copy preserved by Cantelli specialist and author Keith Bennett, whose comprehensive notes on this concert can be found below, a condensed version of which is also available on the CD cover. The tape preserved a BBC rebroadcast of the concert, which omitted the opening and closing announcements of the original but included Ben Grauer's commentary between the Vivaldi and Brahms. Additional BBC announcements have been removed from this reissue, but Grauer's words have been preserved. Overall sound quality of the originals was generally excellent for its era, and the recordings have responded very well indeed to XR remastering, producing a fuller and more vivid sound where it had perhaps been just a little flat and overly strident in the upper registers. The majority of readers seeing the name of Vivaldi in the programme will not see anyting remarkable in that. However, the first time the writer heard any of this composer’s music was as a 22 year-old: it was in a concert given by Cantelli in the Royal Festival Hall in October 1951 and it was the first time that any Vivaldi had been played in the hall which had been inaugurated the previous May. The NBC Symphony Orchestra came into being at the end of 1937 but, despite the fact that Toscanini included Vivaldi’s Concerto Grosso Op.3, No.11 in his very first concert, the conductor who included the works of Vivaldi in his programmes with this orchestra more often than any other was Guido Cantelli. Although Cantelli gave more concerts with this orchestra (40) than any other conductor apart from Toscanini, he still only gave three of the four works in his repertoire with the orchestra and Vivaldi was only played in six concerts. 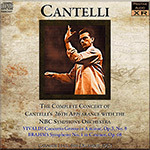 Cantelli had conducted this concerto for the first time while still a student in 1942 and his only other performances were both with the NBC Symphony Orchestra: on 15 January 1951 the first-desk soloists were Mischa Mischakoff and Max Hollander but for the performance on this CD (which was his last) the violinists were Daniel Guilet (who had become leader after Mischakoff’s departure) and Remo Bolognini. Toscanini’s last appearances in London were when he conducted two all-Brahms concerts with the Philharmonia Orchestra on 29 September and 1 October 1952 which included all four symphonies and Cantelli was present at rehearsals and the concerts. a studied avoidance of abnormality. The music is presented, both phrase by phrase and in the build-up of the phrases into the shape of a movement, in exactly the way one feels that Brahms wanted, and indeed specified within the limitations that any score has of being specific. When Karajan recorded the symphony with the Philharmonia Orchestra (the second of his six commercial recordings) in 1952 it was once described as a gemütlich view of the work: it certainly does not possess the drive and passion of a Toscanini performance (does any?) and the introduction of rallentandi deprives some of the symphony’s strength. The author attended the 1954 Edinburgh Festival with the main purpose of hearing the three concerts to be conducted by Cantelli and he also heard Karajan conduct this symphony. Between the author’s seat in the Usher Hall and the conductor was a young person who was continually shaking his head during the Brahms (his presence had not been noticed earlier in the programme) – whether from approval or displeasure was difficult to ascertain – that individual turned out to be Guido Cantelli. Cantelli gave more performances of this work – 43 – than any other and had he survived that horrific aircrash on his way to New York four more performances would have been added. As can be seen from the table above, movements 1, 2 and 4 tended to be quicker than his commercial recording. The prize of this release is the Brahms, which, for a number of reasons, is the finest of three Cantelli performances of the work that I have heard. Probably, the most familiar is his 1953 studio account with the Philharmonia Orchestra reissued by Testament in 1993 (SBT 1012). It is a strong, unmannered reading, but without the intensity and seeming commitment of two live performances: one from 1954 with the Boston Symphony (Pristine PASC O83), and this new one, which—from beginning to end—is riveting. Though the Boston performance certainly proved refreshing with a greater rhythmic elasticity than the Philharmonia account featured, it does not match the controlled intensity of this NBC version. Here the line is tauter, the bite stronger, and the cumulative impact of the whole more overwhelming. Then, too, it reveals Toscanini’s orchestra in a more natural perspective than that projected in many of his Carnegie Hall broadcasts. Evidently the microphone was placed at a slightly greater distance than had been customary for him. As a result the ample resonance of the hall was captured more fully. Of the many Cantelli performances I have heard, this one, perhaps, comes closest to those of Toscanini in its rhythmic rectitude, concern for detail, and freedom from mannerism. At the same time, it is not a mimic of his mentor. For one thing, he does not incorporate some significant Toscanini emendations: the addition of trumpets in parts of the first movement, the imposition of accents in the horn call of the introduction to the finale, or the modifications of the timpani part in the coda of that movement. But Cantelli’s treatment of the Andante, like Toscanini’s, is never unduly sustained and utterly free of sentimentality. And the overall sound of the orchestra is less astringent than it often was under Toscanini. At the same time, it is leaner than what one heard from Bruno Walter or Wilhelm Furtwängler. As for the Vivaldi that opened the concert, the best that can be said for it is that it illustrates how far we have advanced as a result of the impact made by the period-instrument approach. Today, for example, the weighty sonority and plodding tempo of the first movement seem utterly misplaced. But as an example of what now seems anachronistic, the performance tells us something of our recent past. As such it has historical value. And certainly for the Brahms this is a release that should be heard. This article originally appeared in Issue 34:3 (Jan/Feb 2011) of Fanfare Magazine.